Paragon Corvette Reproductions - Rear Quarter Panel Front Splash Shield - R.H.
Rear Quarter Panel Front Splash Shield - R.H.
Rear quarter panel front splash shield, R.H. Located behind pillar, press molded, black. Installation Guide: When installing reproduction fiberglass or urethane pieces, please be aware that all Corvettes did not leave the factory with exact identical body dimensions. With dozens of individual panels bonded together there are slight variants from car to car. Therefore when replacing or adding any fiberglass or urethane panels to your Corvette, it is highly recommended that you fit these pieces to the body before you begin painting. It is also recommended that you fit all trim pieces such as moldings or emblems to the new panel before painting. This will help to assure that you do not encounter installation problems after painting. Paragon will not be responsible for any fiberglass or urethane pieces that have been modified, painted or damaged due to installation attempts. 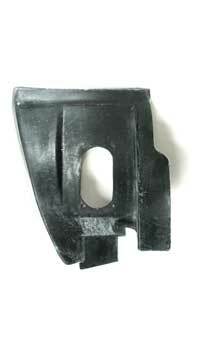 Press Molded (PM): Press molded parts are formed under pressure in matched molds as original. This assures a high strength part with a smooth surface on both sides.